My name is Maura Partridge and I am a sophomore studying Advertising and Public Relations, Spanish, and Marketing. I'm from Louisville, Kentucky and am thrilled to be spending my spring semester in Rome, Italy at the John Felice Rome Center. I chose to study abroad so I could gain a more global perspective and understanding of different cultures. I have studied Spanish my whole life, so I thought it would be interesting to acquire a third language. Through this blog, I hope to share my experiences and adventures with my family, friends, and the Loyola community. On Saturday, April 2, I had the privilege of traveling to Assisi, Italy with a group of students and student life assistants from the John Felice Rome Center. 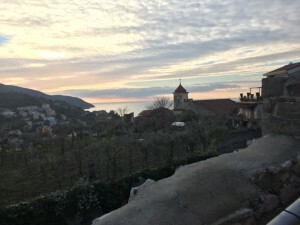 The Assisi Pilgrimage, one of the many study trips offered by my school this semester, begins at the break of dawn Saturday morning and culminates with a dinner of traditional Umbrian food (Assisi is in this region of Italy). I’ll spare the details of the hourly schedule of our pilgrimage, because the times and places themselves are relatively unimportant compared to the lessons I learned. Although difficult to admit, much of my time is spent in the future, anxiously planning the rest of my undergrad career and worrying about grades, success, and basically everything else that consumes the mind of a 20 year-old girl. 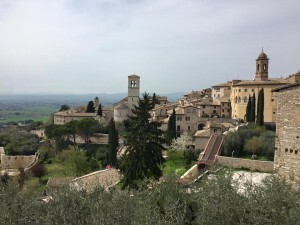 In Assisi, for one of the first moments during my time as a college student, I completely neglected any thought that did not center around the “now” – a challenge, indeed, but a necessary one. Sometimes, it takes stepping back from the paradigms we create for ourselves to truly understand our purpose and significance in the world, and more importantly, the present. St. Francis of Assisi, admired for his humility and simplicity, was the focal point of our prayer and discourse during the trip. His lifestyle, although not necessarily practical for a busy college student who cannot afford to fast for months, for example, shows the significance of daily solitude and reflection, especially during an era characterized by materialism, self-absorption, and constant connectivity courtesy of the rise of digital media. Although I am no saint (far from it, in fact), I challenge myself to live a more humble, simplistic life. Simplicity, I’ve come to learn, means less about materialism and more about overall distraction. Appreciating our current situations, rather than holding the weight of the past and uncertainty of the future on our shoulders, is the simplicity I hope to achieve. With less than four weeks left in beautiful Roma, I pledge myself to living in the moment, free from distractions of what everyone is doing back home. I am eternally grateful for the memories I created over the weekend, and I am inspired to continue reflecting on my progress as an individual as I spend each day attempting to grow in my love and concern for the world around me. At the tender age of 3, I was an avid reader. Before I was able to comprehend the magic of words myself, my parents would spend hours reading to me. I read Anne of Green Gables when I was six years old, after previously finishing all the Junie B. Jones and Magic Tree House books. When I misbehaved, my parents would hide my books, rather than limiting time in front of the TV or on the computer. In fact, I attribute much of my growth – intellectually and spiritually – to the beautiful gift of literature. That being said, visiting bookshops in foreign countries has recently become one of my favorite activities while studying abroad, whether I am able to understand the language or not. So far, I have had the privilege of visiting a bookstore in Brussels, Belgium, where French is widely spoken, London, England, where I was luckily able to purchase a few books thanks to the fact that I actually speak English, and Amsterdam, Netherlands, where most books are in Dutch, with a limited selection of English books. Perusing bookshelves full of beautiful masterpieces by renowned authors is nothing short of euphoric. I am absolutely weak for the beauty of words and their ability to tell a beautiful story when strung together in a unique and heartfelt way. This is my nirvana. For an instant, I experience true artistic beauty and I am devoid of any further wanting or desire. I find myself happily wandering from book to book, always searching for translations of my favorite books or anthologies by authors including F. Scott Fitzgerald, Ernest Hemingway, T.S. Eliot, Kate Chopin, and more. Literature has and forever will be one of my greatest passions, my dearest love, and the comfort I long for when I am a wanderer in an unfamiliar city. Miles from home, and often in places where I do not understand the language, I have found a light that warms my soul and feeds my heart’s desires. of learning. I am absolutely enamored by the endless possibilities and practicalities that speaking multiple language provides. The rhythmic beauty and dialect of the Spanish language originally sparked my interest, and is one of the many reasons that I have become proficient in speaking the language. Because of this, people are often surprised when I tell them that I am studying abroad in Rome. I arrived knowing no more than ten words in Italian, and it’s been somewhat of a struggle to attempt to rewire my brain with Italian phonetics instead of the English or Spanish to which I have become so accustomed. With a little over two weeks under my belt in the Eternal City, I have developed a curious interest for the Italian language that has allowed me to further my vocabulary and pronunciation skills that I once lacked. The ability to immerse myself in the language through mundane daily activities – taking the bus, ordering espresso with breakfast, and asking a local where something is – have embodied the beauty of Italian culture, language, and the wonderful citizens that inhabit it. Beautiful sunset on Saturday, January 23. The photo does not do it justice! Although for now, I am merely an observer, attempting to eavesdrop on conversations to pick up some of the few words I know, and quite obviously an American, with my blue eyes, fair skin, and inability to communicate proficiently, I anxiously anticipate the adventures and opportunities that await me with this brand new language that I quickly have grown to adore. And, while I continue to introduce myself with “Me llamo Maura” instead of “Mi chiamo Maura,” I am grateful for the challenges of learning a third language and the omnipresent opportunity to expand my knowledge inside and outside of the classroom.